4 Free Technology Tools for Your Writers Workshop! 4 Free Technology Tools to Jazz Up Your Writers Workshop! Staff Spotlight: Herman Makes it Happen! Jazz Up Your K-5 Writers Workshop With Technology! First, do you know what the writing standards require in technology? If not, take a quick look before reading on. The expectations increase as kids move through the grades. First, second, and third graders must “use” (rather than “explore”) those digital tools. Fourth and fifth grade students are required to use not just technology, but specifically the Internet to produce and publish writing. One way to approach digital applications is to use whatever is already available on your school’s computers. Here’s an inspiring portrait from Edutopia, showing how one fifth grade teacher guides students into using Apple software to publish student narratives, poems, and other creative projects. Mrs. Dalesio’s fifth graders are using iMovie and other digital applications to publish narratives, poems, and even math tutorials they’ve created. These are inspiring examples by a teacher who’s obviously a real tech whiz. But don’t worry if you and your students aren’t as tech savvy as Mrs. Dalesio and her class. If you teach younger students, or you just aren’t ready to tackle video production, here are some equally exciting options. StoryBird is a free online application students can use to publish their stories, poems, book reviews, ads, and anything else they can imagine. Younger children can work with friends, parents, and teachers to create online versions of their illustrated stories and share them. 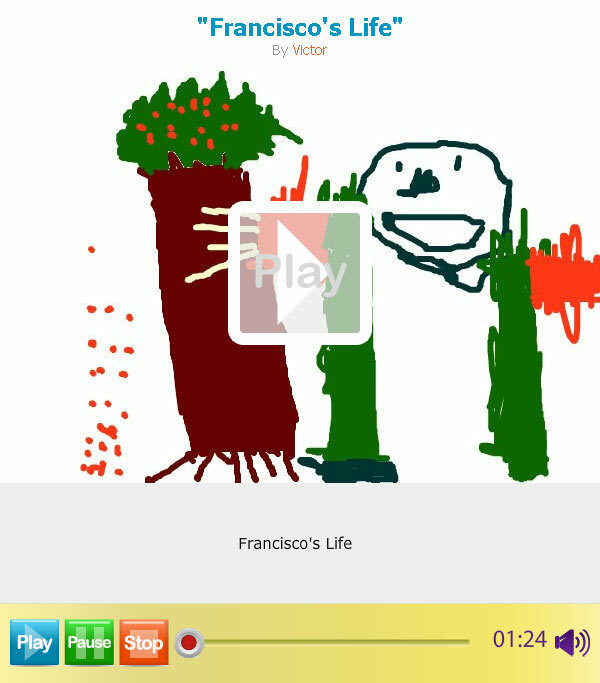 Although the tutorial below doesn’t mention it, children can upload their own artwork. Try recruiting a few parent volunteers to learn the application at home and help you as roving assistants when you teach your class to use StoryBird. The 4 1/2 minute tutorial below will show you the creative possibilities in this simple tool. How does it work? Each reading is saved as a short video and stored on the site for others to view and hear. Little Bird Tales stories can also be emailed to family and friends; online Mother’s Day cards, anyone? Though the interface is not as slick as StoryBird’s, being able to hear the author’s voice adds a something special, as you’ll grasp when you hear the story below by four year-old Victor. Little Bird Tales can even be shared by very young children like four year-old Victor. Much like StoryBird, it’s a free online application that helps students practice reading and writing skills. Little Bird Tales also addresses the speaking and listening standards. With ePals, your students can correspond safely with pen pals from other cultures. Here are even more tools, some with links to student samples, from Nicole Dalesio, the teacher in the first video. But digital publishing can also be meaningful with less glitzy activities. Book reviews uploaded to your local library website, and persuasive letters or comments submitted to your town’s online newspaper give kids a thrill, too. Writing for people they might actually know is meaningful and engaging, and helps kids connect their writing to an authentic purpose. With a winning smile and a presence that glows, Awareness Ambassador Herman Humes brings not only 38 ½ years of classroom experience to his work, but also some wonderful personal qualities. Here’s something about Herman you probably don’t know. During his long career teaching K-5 children, he also spent many summers as a group therapist for children whose parents were in co-dependency and substance abuse treatment. Herman also brought this training into the monthly Family Nights he created at his school with a long-time teaching colleague and friend, Arlynn King (now WriteSteps’ coaching director). Among other things, Herman and Arlynn taught families healthy ways to relate to each other and solve challenges. They called their program Parents Empowering Parents, and were twice honored for their work with Ypsilanti Community Partnership awards. Awareness Ambassador Herman Humes taught in K-5 classrooms for 38 1/2 years and twice won awards for organizing literacy and drug-prevention programs for families. Herman says his children, Zoey (age 13) and Kenlee (age 8), think WriteSteps is the best! With Arlynn’s help, Herman brought WriteSteps lessons to his kindergartners, who he said had an unusual amount of “high activity issues” and low academic skills. Come see us at a conference this fall! You can meet WriteSteps team members, try the eWriteSteps teacher portal to our online lessons and videos, and win lessons, kindles, and other prizes. We’ve already been to Boston and Nashville this month, and you can meet us in Indianapolis in September. Curriculum Creator and third-grade teacher Denise Dusseau will exhibit at the Indiana Charter Schools Conference and Expo, September 20. Get more information here, and join our Facebook page to stay updated on more WriteSteps conference appearances!